A burger restaurant in Soho, the second under this name. 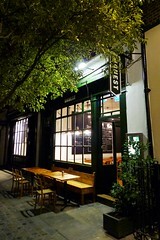 The original location is in 'Brixton Village' (part of the Brixton Market) and has garnered many positive reviews. This location has taken over the site from the old Palms of Goa restaurant. The simple black exterior with a couple of outside tables doesn't betray much about the menu (even the word 'burgers' seems to be missing), and inside it has a plain cafe fit-out dominated by the black menu board, similar in fact to the original location in Brixton Market. It's clean and simple, but far from fancy. The menu sticks to three basic burger options: chicken (£8.50); beef (£7.50 for the basic, plus 50p for a choice of cheese); and vegetarian (£6.50). All burgers are served with crispy fries, and gluten-free buns are available on request (50p extra). The eponymous house burger is a variety of the beef which adds bacon and red onion relish (£9) and is very tasty photo at their Brixton branch. Ewan has tried this a number of times, and it's always been excellent. They also do occasional specials, such as the one Ewan tried on an August 2012 visit, which included black pudding and apple in a tempura batter (£12) photo, again tasty. The vegetarian fritter photo is formed of cauliflower, sweetcorn and shallots along with spices, coriander and a raita, which give it an Indian flavour, and is very pleasing. Burgers are cooked medium as standard, with a bit of pinkness, though they are happy to amend that, and Ewan's medium-rare request was honoured with a pinkish-red hue inside. The drinks menu sticks to a short list of wines and beers, though they do a homemade lemonade served in a screw-top mug (£2.50), which is an excellent example of the form. Accessibility: One step to get in, though there are tables outside. Toilets are on the same level. Last visited by Ewan and Kerry, January 2013. Opening hours taken from website, August 2012. Last edited 2013-01-16 12:49:11 (version 6; diff). List all versions. Page last edited 2013-01-16 12:49:11 (version 6).